R2's – Crop kgDM/cow/day Currently on pasture 6.22 approx. R2's – Baleage kgDM/day 4.65 approx. Fodder beet cows and kale cows dried off now are running together currently and will be split later next week. Hub kale crops are averaging 12 T DM/ha (Yield range 9.5 to 13.7 T DM/ha; DM % range 8.8 to 12.4%) measured 16/5/18), compared to our budgeted yield of 14t/ha. To reduce pressure on our winter kale feed budget, we are reducing the kale allocation and substituting it with PKE for 2 weeks to put cow body condition on quickly before phasing out the PKE and increasing the kale allocation. 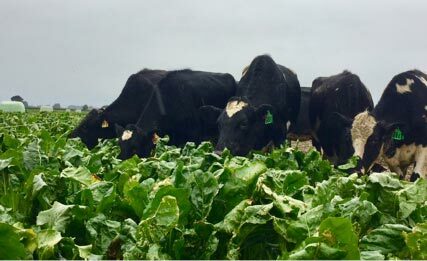 Any excess fodder beet will be pushed forward into the spring where it will either be grazed in situ by the Standard impact FB (Std FB) and Low Impact FB (Low FB) milkers or lifted and fed as a supplement or lifted and stored. Catch fences are used on each herd. The herd had an empty rate of 7 – 11%. This is either 7% of cows scanned or 11% of cows mated. The 11% is from start of mating inclusive of cows culled due to Staph outbreak and the dry period. We farewell our current farm manager Jason at the end of May as he returns to the Waikato. Jason has done a great job in a very challenging set-up season on this first-year conversion. He has led from the front of our farm team whilst working through all the problems any first-year conversion has plus has helped us get set-up for the next phase of research moving into 4 farmlet systems next season. Plus, he has had to deal with all the other problems farming throws out including mid-July calving cows, 80% new grass in spring and very wet conditions followed by a drought! We thank him for all his effort and wish him all the best for his next project.